Fly to Xian. Upon your arrival at the Xian Xianyang International Airport, you will be greeted by the local guide and driver. Then transfer to the hotel. The rest of the day is at leisure. 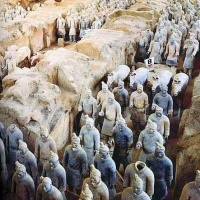 Make a full day sightseeing to the Terracotta Warriors and Horses, the Bell Tower, the Drum Tower, and the Xi'an Ancient City Wall. Suggestion: We can arrange bike-riding visit on top of the city wall. If you prefer cycling to walking please tell your travel consultant when inquire this tour package. After breakfast, be picked up to visit the Taoist Temple (the Temple of Eight Immortals). Then drive about 1 hour to see the Cave Dwelling Village. After Chinese lunch, visit the Shaanxi Provincial Historical Museum. 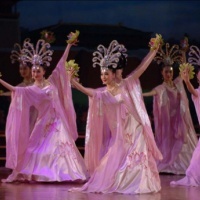 In the evening, enjoy the dumpling (Jiaozi) banquet and the wonderful Tang Dynasty Show. After breakfast, be driven to see the Big Wild Goose Pagoda. 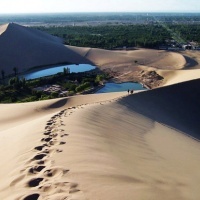 In the afternoon, be escorted to the airport for the flight to Dunhuang. Be met and transferred to the hotel. Full day tour to the Mogao Grottos (Mogao Caves), the Echoing-Sand Mountain and Crescent Lake. Travelling in the boundless desert, you will sure to be exciting today! Optional special activities: camel riding; sand sliding; parasailing. Make a full day excursion to the Yumenguan Pass, Dunhuang Yadan National Geologic Park (aka Ghost City), and the Yangguan Pass Museum. Take bus to Qomul (about 5.5hrs). Check into the hotel. Full day visit to the Qomul (Hami) Melon Garden and Tang Dynasty Buddhism Pagoda. Transfer to Turpan to visit the Gaochang Ruins and the Jiaohe Ruins. After breakfast, visit the Grape Valley and Karez Well, and then the Flaming Mountain. 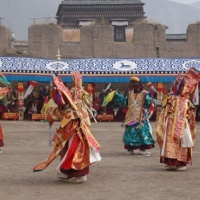 Have sightseeing to the Tuyugou Valley and the Bezeklik Thousand Buddha Caves. Have lunch in a family in Tuyugou. Continue to drive to Urumqi. After breakfast, visit the Xinjiang Uighur Autonomous Region Museum and the Erdaoqiao Bazaar. 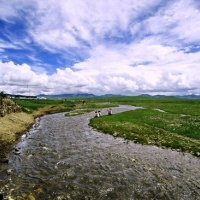 In the afternoon, make an excursion to the Terai Camp and the Nanshan Pasture. Take morning flight from Urumqi to Kuqa (Kuche). Check into to the hotel. Then visit the Kizil Thousand Buddha Caves and Subashi Ruins. Take morning train to Kashgar. 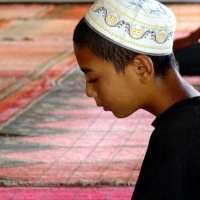 Visit the the Etigar Mosque and Sunday Bazaar. Drive to Upal to see the tomb of Mahmud Kashgar and the Lake Kalakuli. Visit the Abakh Khoja Tomb. Then take bus (about 8hrs drive) to Hotan. Check into the hotel. Full day visit to the Yarkand Tomb, Local Smith workshop, and Fig Garden. (Have supper at Fig Garden). Ride camel to see the Rawak Site (about 5km). After lunch, visit a family who makes paper, and then visit the Ai Te La Silk Mill. Fly to Urumqi and check into the hotel. Be escorted to the airport for the flight to Beijing. Be met and checked into the hotel. Rest of the day is your free time. 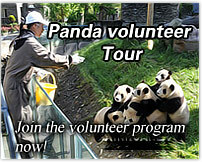 Have a full day exploration of the Forbidden City, the Temple of Heaven and the Summer Palace. Peking Roast Duck for lunch. After breakfast, make an excursion to the breathtaking Great Wall at Jinshanling. Visit the Beijing Hutongs by Rickshaw. After lunch, visit the Bird's Nest and Water Cube. In the evening, watch the Legend of Kung Fu (a famous night show in the world). Say ""zaijian"" (goodbye) to your guide and driver at the airport.